Ventured to MacPherson near the 24hours KopiTiam to one of my fav for a bowl of boiled turtle soup. Although I have to agree that it is not for the animal lovers and the faint hearted, I was drawn for the fact that the meat served is so tender and sweet. One thing for certain is that the soup served is always boiling hot. 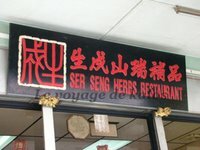 Personally I like the soup as it does not taste too “herbal’ish” and the service is fast. Seated for less than 5 minutes (after ordering) and you should expect to be served. However service is less than desired as staffs are usually uncouth. You will often get the feeling that you are being forced to gobble down your food. My favourite combination would be to order the yam rice to go with the “skin of the leg” for the soup. The jelly-like skin of the turtle beats the “agar agar” anytime.